An expression of love and remembrance, this exclusive bracelet makes a meaningful tribute to your loved one and will be a treasured reminder of the everlasting bond you share. 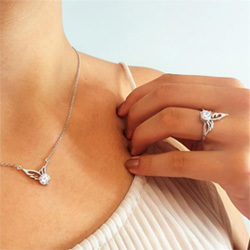 The entire piece is masterfully crafted in rhodium-plated sterling silver, and features a sophisticated angel heart charm securely attached to a sparkling circle set with cubic zirconia stones. The accompanying links are fixed to the circle to ensure carefree wear. The charm is fondly engraved with the comforting words, “A piece of my heart has wings”, words that will bring out the treasured memories that comfort you and help you heal. I order 3 of them and my sisters love it. And I love my. This item is absolutely beautiful. If you have a larger hand hard to squeze on ,but once on wrist gorgeous. The writing on the heart seems faint but a beautiful item .